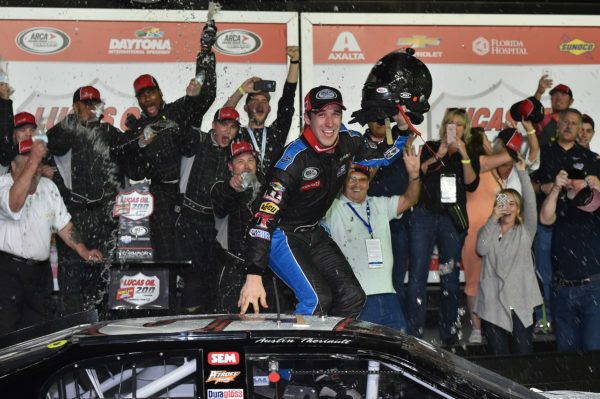 Austin Theriault (52) celebrates winning the Lucas Oil Complete Engine Treatment 200 at Daytona International Speedway, Feb. 18, 2017. Fort Kent native Austin Theriault finished ninth in Friday night’s ARCA General Tire #AnywherelsPossible 200 at Pocono Raceway on Friday night. It was his worst finish of the year, but he still maintains a healthy lead atop the ARCA points standings after seven of 20 races. He has a 135-point advantage over runner-up Dalton Sargeant. His previous lowest finish was a sixth. Theriault started 12th in his new Schrader Racing Ford, but he elected to stay out while several of the cars ahead of him pitted. It worked out nicely for him when a caution flag came out and that enabled him to gain track position when he pitted on lap 40 of the 80-lap race over the 2.5-mile track. He came out third for the lap 41 restart, but his car kept losing spots as the race progressed, resulting in his ninth-place finish. There were 34 cars in the field. Eighteen-year-old rookie Riley Herbst picked up his first ARCA victory and moved into third place in the points, 235 behind the 23-year-old Theriault. Not the result we were hoping for this weekend @poconoraceway. Car is in one piece, so we can work on getting better for @MISpeedway. Theriault’s next race will be the Corrigan Oil 200 at Michigan International Speedway in Brooklyn, Michigan, at 6 p.m. Friday. That is where Theriault made his ARCA debut, and he won the race while racing for Venturini Motorsports in 2014. It is a two-mile track.